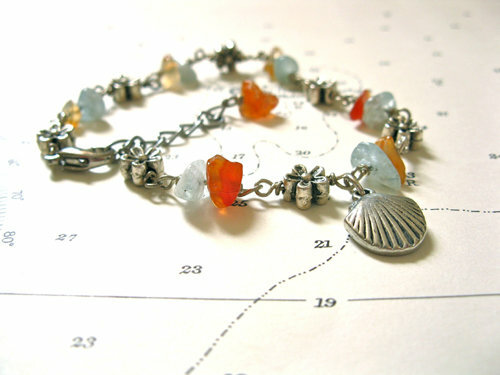 This charming aquamarine and agate Camino travel bracelet consists of the prettiest pale-blue/green chips of aquamarine mixed with the warm amber colours of agate and bali-style silver-coloured flower beads. It features a small scallop shell charm, symbolic of the Camino de Santiago pilgrim route. The 1,000-year-old pilgrimage to the shrine of St. James in the Cathedral of Santiago de Compostela is known as the Way of St. James (El Camino de Santiago - in Spanish). Some 200,000 pilgrims travel to the city each year from all over the world to find inspiration and/or deeper spiritual understanding. 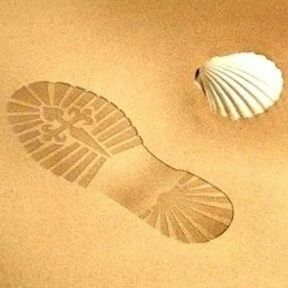 Many carry with them a symbolic scallop shell like this. Dimensions: The bracelet is fastened with a lobster clasp and measures approx 7.5" in length with an additional 1.25" extender chain finished with a tiny chip of aquamarine or agate. With symbols of luck and protection, this lovely piece of Camino jewellery makes for a magical and powerful charm bracelet. The perfect gift for a loved-one setting out on a journey. Ideal gift for travel. Comes gift-wrapped (with an information card option) like all our presents - and we can print a personal message on your behalf. AQUAMARINE: The lucky gift for travellers . . and partners. Since ancient times, Aquamarine has been associated with luck, happiness and courage . . primarily for travellers. To many ancient cultures, Aquamarine was also a symbol of happiness, courage and everlasting youth. More information about Aquamarine . .